Moving a "Saturday Sabbath" to a "Sunday Sabbath"? 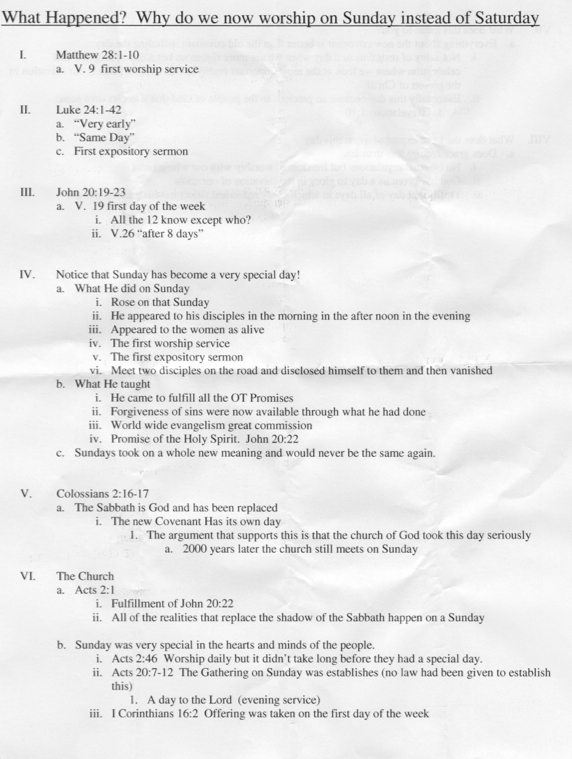 The best explanation from denominational Seminarians to justify moving a “Saturday Sabbath” to a “Sunday Sabbath”—AMAZINGLY SAD AND FUNNY, AT THE SAME TIME. I think most people in christendom today have NO IDEA how “lame” the reasons are by “Seminaries” for “attending Mass” (or the protestant “service”) on a “Christian Sabbath” called “Sunday”! All of modern religion is based on some of the most ridiculous, laughable reasoning anyone could imagine. When asked “why” the day called “Sunday” is only mentioned TWICE in the SIXTY YEARS on the New Testament Record—the answer is, “Well, ummm when the disciples fell at Jesus’ feet after He was raised, that was “the first worship service” and that was on Sunday. You’re KIDDING, right?! THE FIRST WORSHIP SERVICE? And “the first sermon”??!! Come ON! It was Jesus’ friends and companions AMAZED to see “their Lord and their God” murdered brutally by the religionists, and now ALIVE. The “first worship service”—so now everyone should have a holy day for “attending” because of that? AMAZING dishonesty with the Scriptures. But, the holy day moved to sunday idea has been passed on for hundreds of years, and often by either folks who aren’t thinking, or by folks who want “cheap grace” and want to “love the world” are all FOR a holy day, rather than a SET APART (“Holy”) LIFE TOGETHER. Such a life of independence and holy days yields only broken lives, however. To play the word games by seminarians (attachments) in order to justify compartmentalized lives is “easy” but spiritually suicidal, as the denominations have proven with their loss of 75% of their entrusted souls to the devil, by their OWN statistics (Barna, Promise Keepers, Ken Ham, TD Jakes, etc etc). We only hurt ourselves when we don’t LIVE as Jesus and the Twelve and then the 5000+ LIVED together, but only “attend” a religion as the other world religions with false gods do, with their holy man and holy day for attending a shrine or temple. It is NOT Jesus’ Way, and can NEVER bear Jesus’ Fruit to do it man’s way. Any young child with common sense knows the absurdity of such reasoning by “seminarians” about “attending” a Mass or Service on a “holy day” from the Old Covenant Saturday that has magically transported itself to the next day, Sunday. As if GOD couldn’t have made such an immensely Important topic clear in the Scriptures? The same God who wrote Leviticus FORGOT to tell us about a total radical change in our entire relationship with Him? No way. It is AMAZING to see how weak the reasoning is by denominations and seminaries to justify clergy/laity holy man and holy day, moving the “shadow” of Sabbath unBiblically from Saturday to Sunday, instead of into JESUS rather than “times and seasons” and “special days” and “sabbaths”. When you see it in print (see their own explanation by denominational seminarians in the attachments)—it is staggering. Dishonest and manipulatively absurd, actually.